I have defeated procrastination and placed his dreary head onto a trident! That’s right! 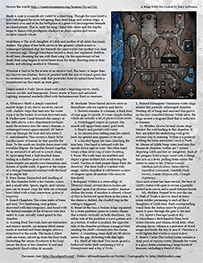 I’ve had one hell of a time editing my words down into 3 columns of 9pt font, and refused to partake in the lure of Tribes Vengeance long enough to have finally succeeded in creating a one page dungeon for this year’s contest! It’s been really hard to push myself to get through this because I’m in the midst of buying my first home, not to mention the real world seems to have the chaos pedal pushed to the floor this month. Another pitfall has been that I’m normally quite verbose when it comes to writing, so paring down the word count here was one hell of an exercise. It was a good one though, I’ll be sure to write more about that actual process soon on my personal blog. I’ve made the entire delve completely system neutral, as a matter of fact there is no mention of DC’s, CR’s, levels, action economy, etc. I did this in order to not only fit all of my vision onto one page, but to ensure that this could be played with as many systems as possible. But wait, that’s not all I’ve left out on purpose! I really wanted DM’s to get a good feel at what I’m trying to accomplish here without railroading them, assuming that most DM’s will take this and run with it. I think there’s just enough clue and implication here to give a clear picture, and simultaneously open enough to make it your own. There are many choices entirely left to be governed by whomever runs this module that will make it interesting for each group of players, and perhaps multiple playthroughs. For some ideas on what I’m talking about, be sure to grab the full 3 page version complete with treasure descriptions, monster index, a large map, space for notes, and some points on running the adventure. If you liked this and you’d like to see more, please keep your eyes peeled right here. If you don’t like it tell me why as I’d greatly appreciate it and any feedback you might give me. I did put a lot of work into this, but perhaps not as much as I’d have liked to. Anyway, this is just a sliver of the campaign world I am currently working on, this map here keys into a much larger area map that I have a lot of plans for. The absurdly talented d20Monkey will be doing illustrations and cartography for me in these endeavors so at least if you hate my design, you can still love his artwork. I’ll be working mainly on system neutral material should until 5e’s release. Aside from the obvious beauty of being able to material in multiple systems in the meantime, it should make converting over to 5e relatively easy once its available. That is unless we’re allowed to publish 5e material once the public playtest starts, in which case I’ll hop right on that! I like the page layout. The “no system” setup allows for more general information and a better, more cohesive background/plot. Depending on the GM, the encounters can be made more challenging, according to the bent of the party. The setting, while not unique, has been given a new spin by making it a lair for uncommon sea creatures. I like the placement of useful treasures, both new and classic. They all seem to fit with the setting. The “hook” seems to be the most throwaway part of the adventure. The description and location lend to many other more campaign-specific hooks. Thank you for your feedback! I appreciate it! Yeah the hook might be a little weak, but all within time it will make more sense as I paint a bigger picture and release material taking place directly within the city. Wow love the layout, the map is beautiful, can we get a easy to print as a battlemap version? Or the original PSD if its a photoshop file to edit and print? Not had time to read it but unless there is a playtest adventure for the new 5e run out this might be a perfect setting to test the new 5e beta test. Great stuff mate, thanks for sharing. Thanks! I don’t have a battlemap version as that’s not something I have any experience with, perhaps d20Monkey does? I’ll ask him and get back to you. I did in fact create this with 5e in mind, so I hope people enjoy running it as a one off, or perhaps wedging it into a campaign somewhere. Cheers! I also love the layout. The hook is fine — you can’t be too specific, as some groups will jump at opportunities that balk other groups; everyone will tailor the hook to their players anyway. I can’t wait to see more! You have been bookmarked! Thank you very much! Thanks for commenting too! Looks like a cool adventure. I had trouble reading it. Something about the spacing. I’ve seen that happen in MS Word when trying to auto-space to fill an area. It sometimes leave s spa ces within wo rds. I can’t wait to see the rest of the campaign world.